I had an old gumball machine that I hadn’t used in years, and now that gumballs are a choking hazard for half of my household, it was time to do something else with it. The solution? 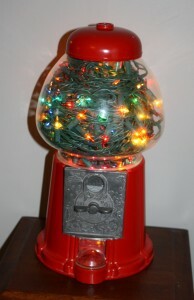 Turn it into a light for the playroom. And it was so easy. 1.) 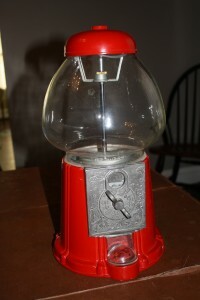 Start with an ordinary gumball machine. 2.) Unscrew the top of the gumball machine and the top bracing mechanism. I also took out some of the lower “guts” to make room for more lights. All pulled out easily. 3.) 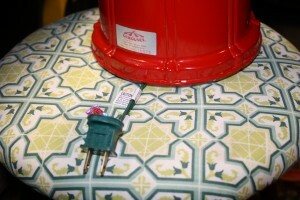 Take the wall plug and push it through to the bottom and out through the side. 4.) 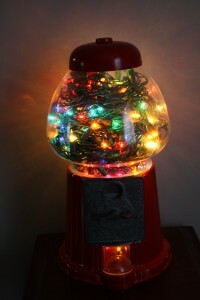 Wind the lights around the center pole, as though you were decorating a very small Christmas tree. I used a 300 strand of colored lights because that’s what I had leftover from Christmas, and that turned out to be a lot of lights. I ended up pushing some down into the lower portion, which has the fun effect of making the gumball dispenser area glow. The 300 strand is maybe too many lights, while the 100 strand looked too puny. A 200 strand (or two 100 strands) seems to be the Goldilocks number. 6.) The glass gets hot after a while, so do not leave the lights on for long stretches (overnight would be a bad idea) and make sure to keep it out of reach of kids. LED lights would generate less heat, so I recommend those. Enjoy!